You might have recently seen the Gate (and numerous other theatre organisations) tweeting about being #CAPaware. This social media buzz was created by StageText in order to raise awareness around captioning theatre and to highlight how invaluable captioning is. If you didn't already know, StageText is an organisation that enables deaf, deafened and hard of hearing audiences to access theatre, and culture at large, in the UK. Their services are invaluable. Not only do they allow people to access a performance in its entirety, but they also act as a social catalyst for change. StageText’s #CAPaware week inspired the Gate to think about equal access and what we offer and why. 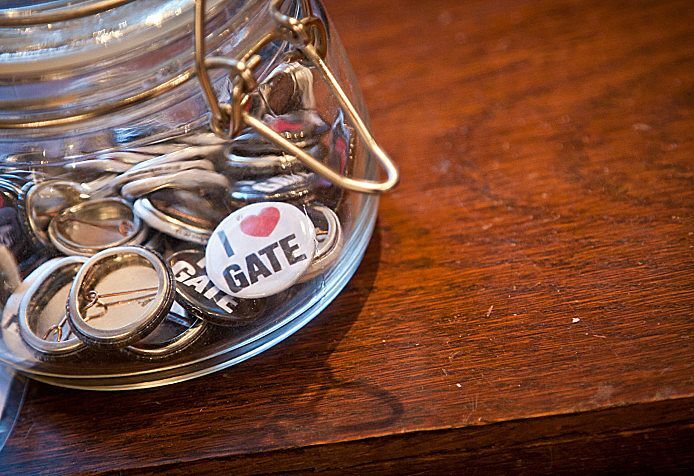 Intrinsic to the Gate’s mission is the notion that: we welcome anyone who wants to change the world. That's why our captioned performances (we do one per production) are so essential to the work we do at the Gate. It is not an “add on” to our work or something to be seen as separate but, for us and many other theatres, core, essential audience development. For each captioned show we also hold a post-show talk which we live caption, because we know that the chat you have after you’ve seen a show is as important as what happens on stage. (Check it out here - Medea Q&A Captioned Transcript.) For our recent production of Medea we also captioned our behind the scenes video. During the #CAPaware week, we met with Adam Werlinger (Digital Programme Manager at StageText) and I confessed that I often watch Netflix with the captions on when blowdrying my hair in the morning (call to arms: all to watch Master of None, your life will be complete). Surprisingly, Adam told me I was the second person to make that same confession that week. And at that moment, Adam revealed something to me that I hadn't quite grasped until that moment: I was a caption user. Adam filled our brains with brilliant statistics about how many people use captions (55,000 people a day use subtitles on BBC iPlayer, fyi). Those people are a combination of people, like me, who find it helps in certain situations and there are others who use it because it’s essential for their viewing (and everyone in between). What I learnt during #CAPaware week (which will stay with me for a long time) was that our captioned performances serve our deaf, deafened and hard of hearing audiences but they also serve all our audiences. Or, as we like to think, they serve anyone who wants to change the world. Array (  => Array ( [id] => 102 [created] => 1448878860 [updated] => 1448878860 [ordering_count] => 95 [intro] => In November, the Gate took part in Stagetext's Captioning Awareness Week. General Manager, Chrissy Angus, explains the importance of captioning. [title] => Captioning Awareness Week 2015 [slug] => captioning-awareness-week-2015 [category_id] => 12 [body] => You might have recently seen the Gate (and numerous other theatre organisations) tweeting about being #CAPaware.